Now that we’ve got the foundation laid, we’re going to start configuring our environments to talk to each other and hopefully end up with 5,000 new contacts in each tenant organization. This test verifies that all of the networking and name resolution prerequisites are met in order to be able to add another AD connector to AAD Connect. Run this in each account forest and attempt to communicate with the resource forest. In this step, we’re going to prepare the resource forest and delegated service accounts. Similar to a standard mutli-forest configuration, we’re going to need to specify an account to use to connect with in the remote resource forest. We’re also going to specify which organizational unit structure we want to scope our connector to (well, we need to create it first, technically). 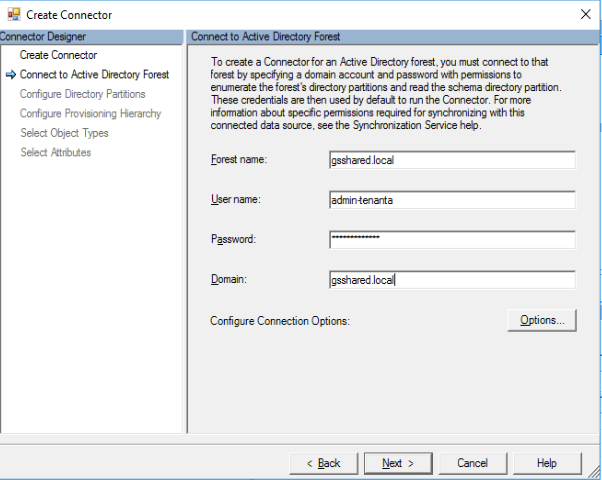 Log into the resource forest domain controller. In my lab, this is gss-dc.gsshared.local. Create an Organizational Unit called something easy to identify, such as Shared GAL. Then, underneath it, create an OU for each organization that will be utilizing the shared resource forest. In the users container (or any other container not in the Shared GAL path), create two new users–one for each tenant. I’m going to name my accounts pretty obvious names: admin-tenanta and admin-tenantb. Select View | Advanced Features. Right-click on OU=Tenant A,OU=Shared GAL, select Properties, and then select the Security tab. Click Add, add admin-tenanta, and then click the Full Control check box under the Allow column. Click Advanced, and then click the entry for admin-tenanta. Click Edit. 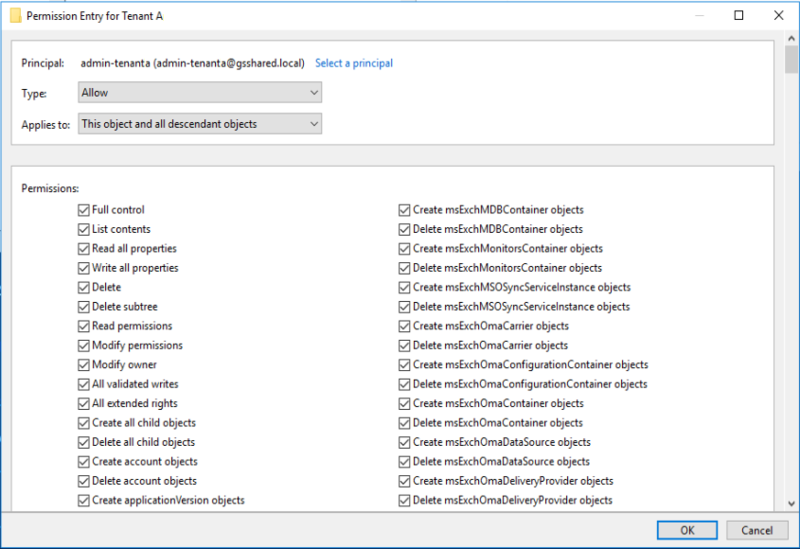 Ensure This object and all descendant objects is selected in addition to Full Control. Click OK. Repeat the procedure for OU=Tenant B,OU=Shared GAL and admin-tenantb. 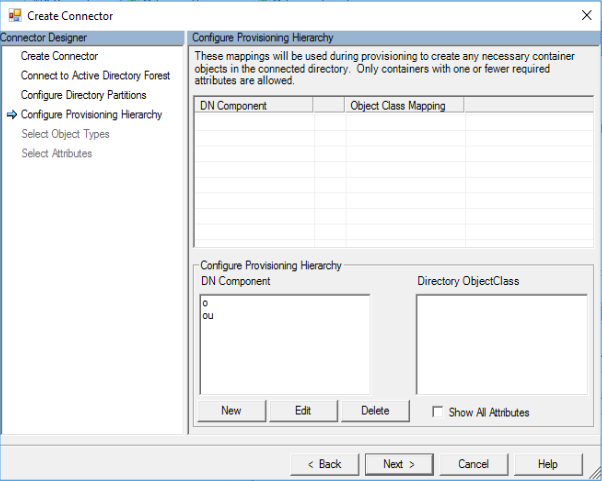 These steps will establish the connectivity between AAD Connect and the resource forest and configure the run steps that will allow connector to execute later. These steps will be performed on each of the account forest AAD Connect servers. 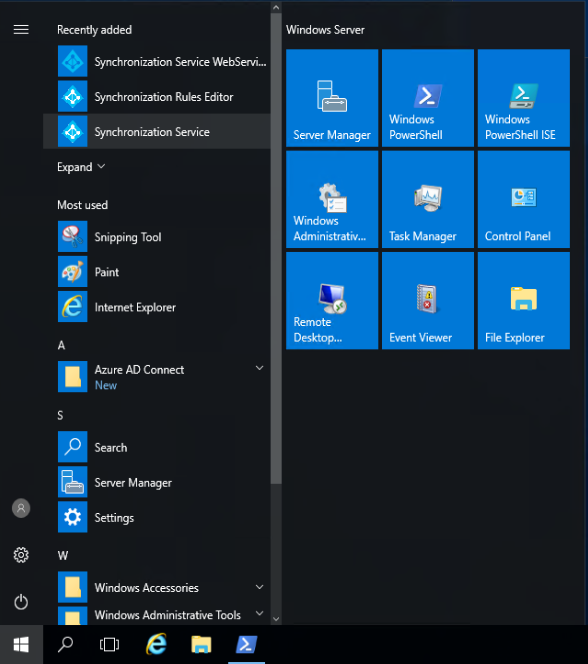 Launch an elevated PowerShell window. Click Start and select the Synchronization Service. Click the Operations tab, and then select Create from the Actions Pane (or right-click | Create in the empty area). 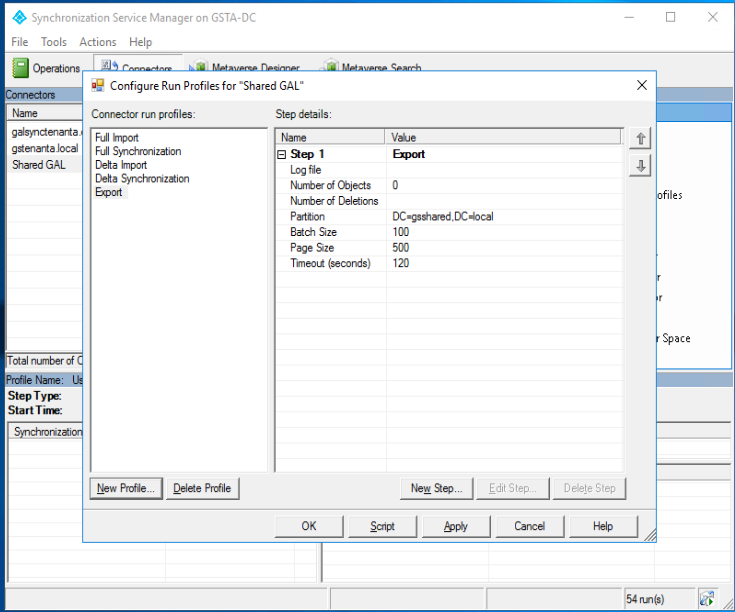 Select the type of connector as Active Directory Domain Services. Enter a name and a description and click Next. Enter the resource forest name, the admin account created previously for this account forest, password, and the DNS domain name. Click Next. 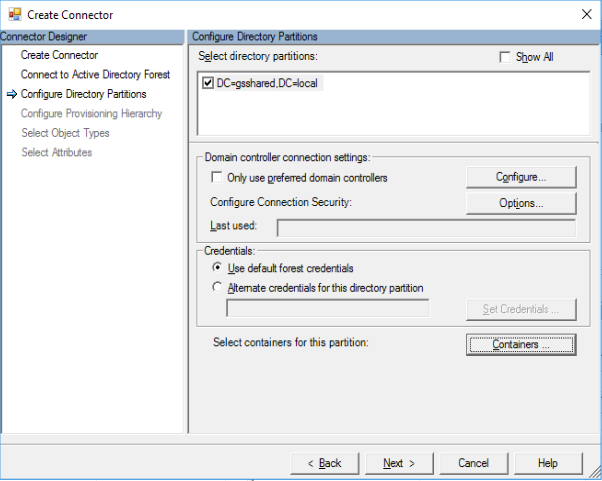 Select the domain partition shown, and then click the Containers button. 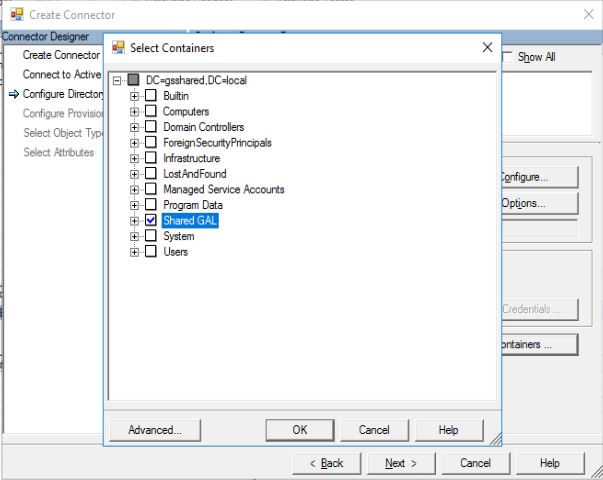 Deselect all containers except the Shared GAL container created previously. Click OK when finished. On the Configure Provisioning Hierarchy page, click Next without making any changes. 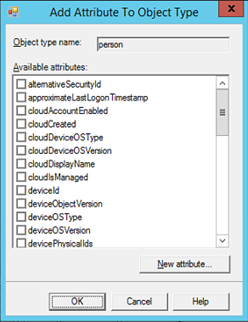 On the Select Object Types page, click contact to add it to the list of selected object types. Click Next. Click OK to complete the creation of the connector. Run profiles are action definitions for the connector. 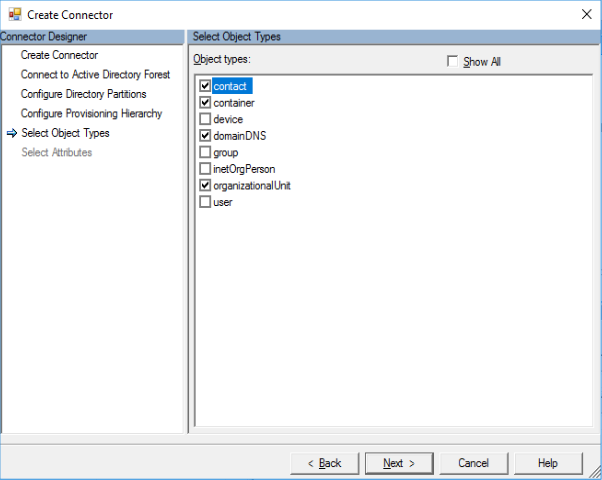 For example, if AAD Connect calls a profile with the Full Import action, it will import all objects in scope in the connected directory. On the Connections tab, right-click on the Shared GAL connector and click Configure Run Profiles. Enter Full Import in the name field and click Next. Select the Full Import step type and click Next. Enter Full Synchronization in the name field and click Next. Select the Full Synchronization step type and click Next. Enter Delta Import in the name field and click Next. Select the Delta Import (Stage Only) step type and click Next. Enter Delta Synchronization in the name field and click Next. Select the Delta Synchronization step type and click Next. Enter Export in the name field and click Next. Select the Export step type and click Next. Click Finish. You should now have 5 run profiles configured. For this custom configuration, we’re going to create a custom metaverse attribute to hold a unique value that we can assign to objects in the remote forest. In the event that we have two objects with otherwise identical properties (for example, two users name John Smith), we can use this stored value which is unique to this installation to ensure uniqueness of objects going to the resource forest. From inside the Synchronization Service Manager, click Metaverse Designer. Click the person object type. 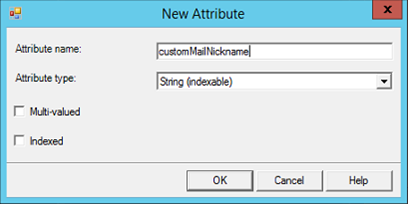 Enter a new attribute name. In this example, I’m going to use customMailNickname. Be exactly sure of what you enter. This is case-sensitive, and bad things will happen if you capitalize it differently throughout the configuration process. 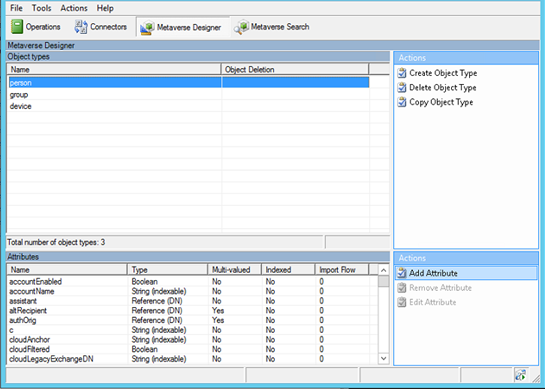 Click OK to close the Add Attribute to Object Type dialog box. Click the group object type. 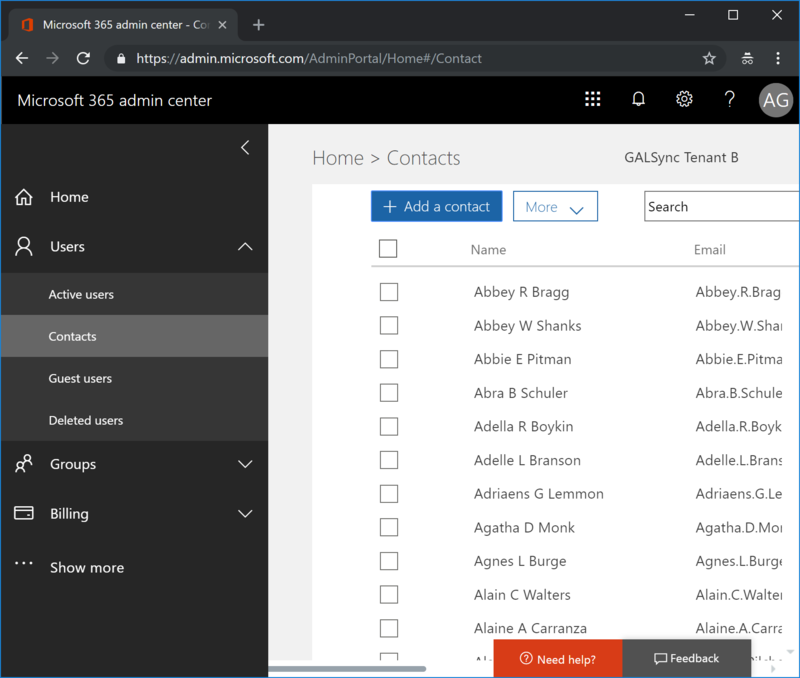 Select customMailNickname from the list and click OK.
Download it to each of the AAD connect servers participating in the synchronization. 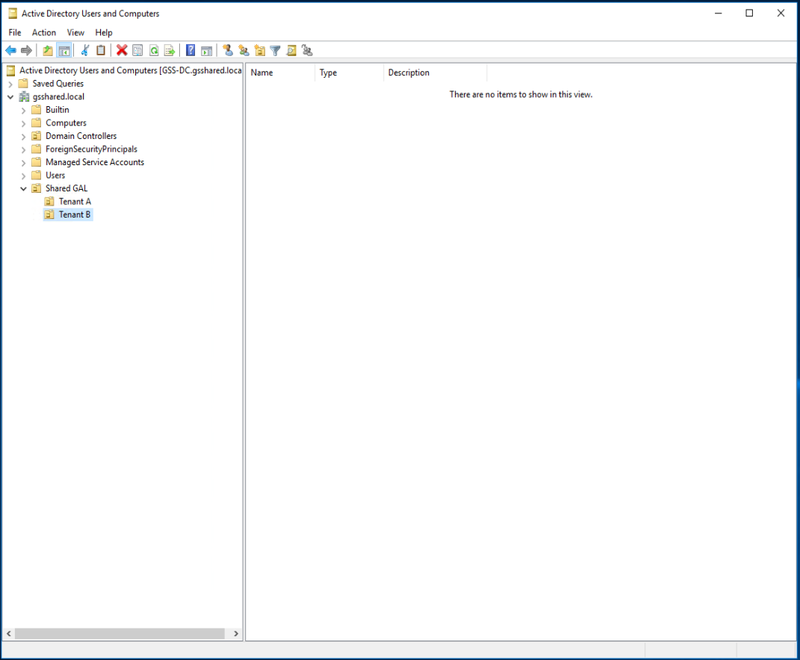 Launch an elevated PowerShell window and change to the directory where you’ve saved the script. The script requires a TargetOU parameter, so, you’ll need to specify the OU that you created above for the forest that you’re syncing from. For example, if we’re configuring this in GalSync Tenant A (GSTA), I’d use “OU=Tenant A,OU=Shared GAL,DC=gsshared,DC=local” as my OU path. 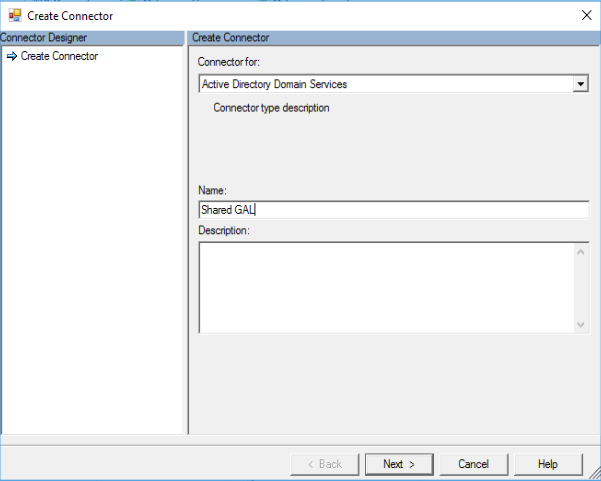 .\CustomGAL -TargetOU "OU=Tenant A,OU=Shared GAL,DC=gsshared,DC=local"
Select the AD connector that represents your current Active Directory Account Forest. In this case, I’m going to choose 1. 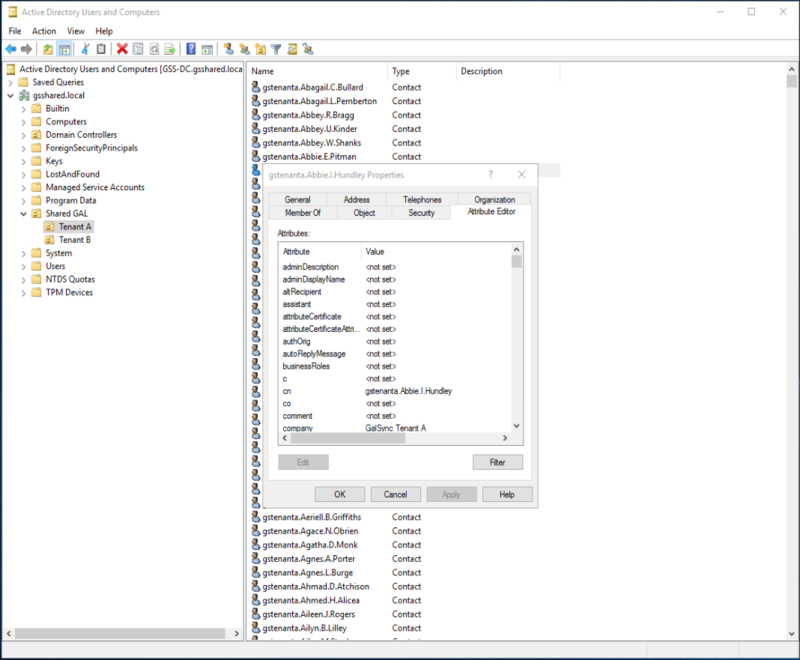 Select the AD connector that represents the Active Directory Resource Forest. In this case, I’m going to choose 2. Confirm your choice. The script will create the necessary connectors. Or, if you’re a glutton for punishment, you can go through the process outlined here to create the sync rules manually. The purpose of this rule is to prevent the flowing of an AD user’s targetAddress into their corresponding contact’s targetAddress when the object gets synchronized out to the GAL. Select Inbound under direction, and then click Add New Rule. On the Scoping Filter page, click Next. On the Join Rules page, click Next. On the Transformations page, click Add. 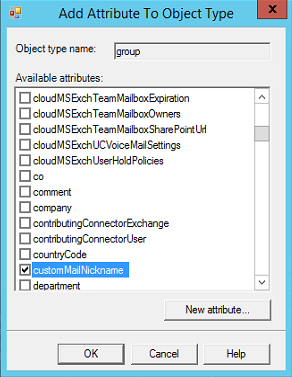 The purpose of this rule is to populate the CustomMailNickname attribute on the objects that will be going to the Shared GAL. It will be used to help construct unique names in the event that multiple source objects have the same alias value. 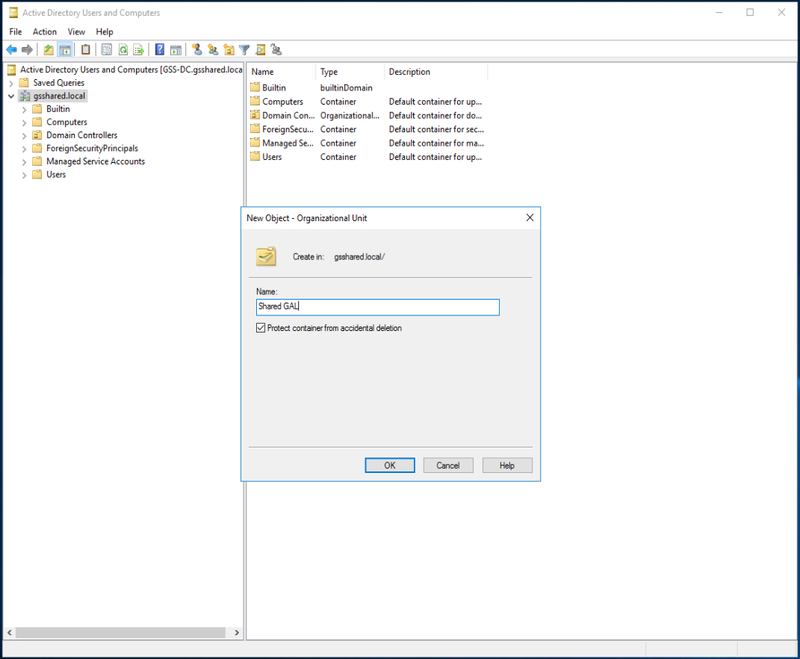 The purpose of this rule is to import objects from the Shared GAL to the AAD Connect metaverse. On the Join Rules page, click Add group. The purpose of this rule is to provision a new user contact object in the organization’s Office 365 GAL OU (the resource forest). Select Outbound under direction, and then click Add New Rule. The purpose of this rule is to provision a new group contact object in the organization’s Office 365 GAL (resource forest). 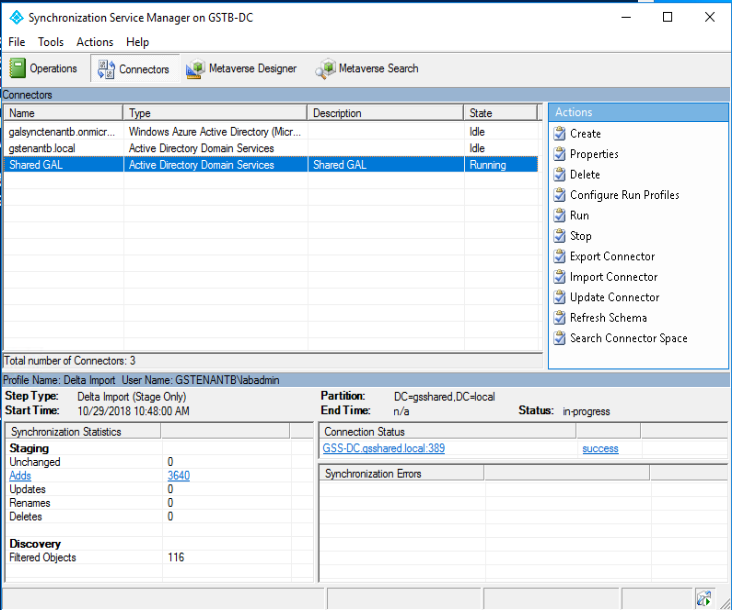 Disable the default AAD Connect synchronization schedule. Launch an elevated PowerShell prompt. 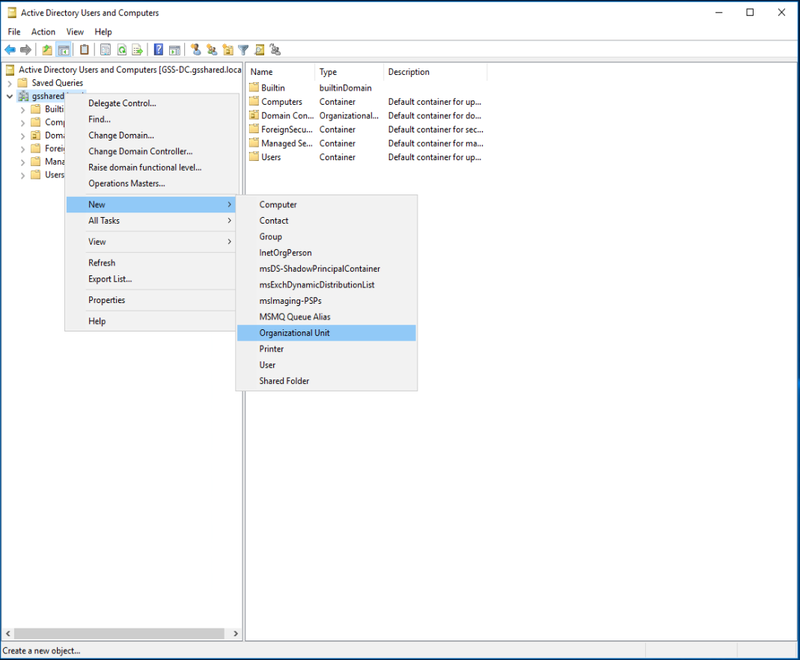 Create new scheduled task to call each of the required run profiles for AD, AAD, and Shared GAL connectors. The scheduled task should be configured to execute every 30 minutes using an account that is a member of both the AADSync Admins group and the local Administrators group. 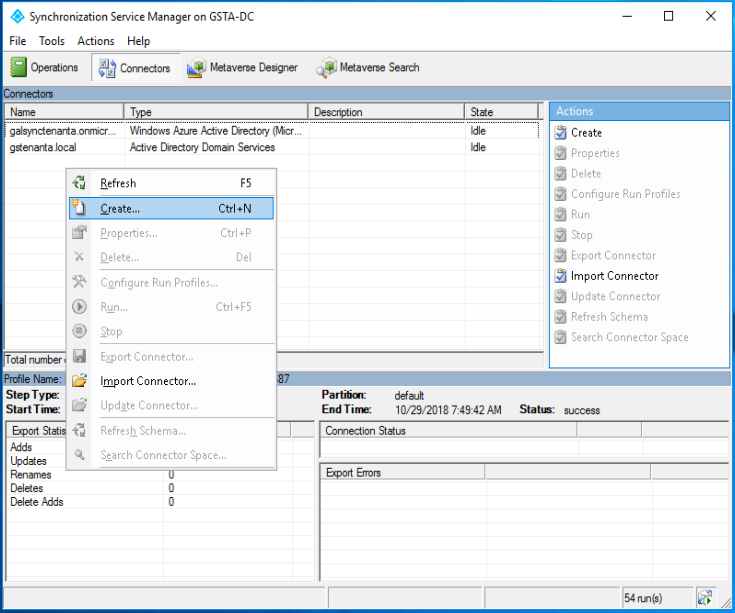 Replace the value after -ConnectorName with the connector name as it is displayed in the AAD Connect Synchronization Service Manager. It is cAsE sENsItIvE. 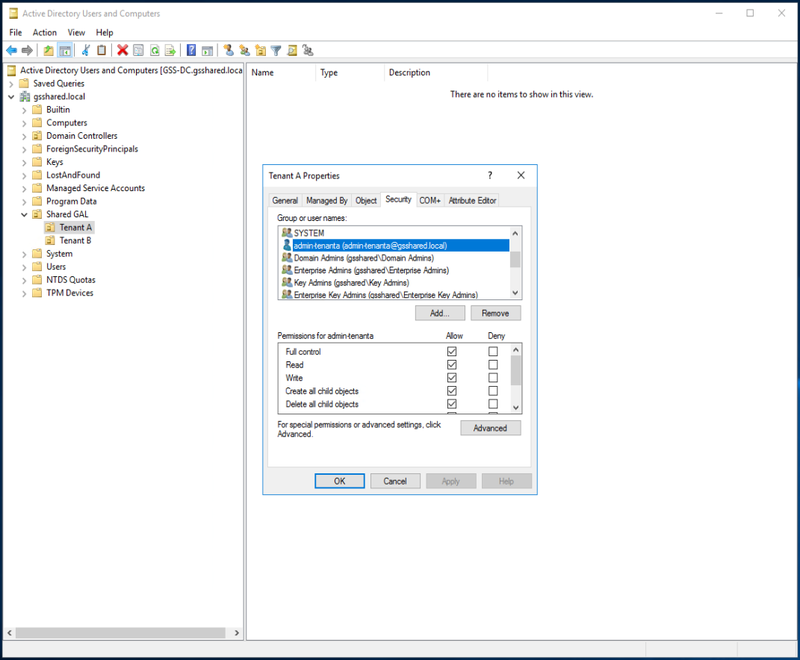 The values for -RunProfileName must explicitly match one of the values specified in the run profile configuration for the connector. It is cAsE sENsItIvE. If you ran the script at the top of this post, it would have created a custom sync schedule script for you. You can execute that, or, if you created your own custom sync schedule script, run that instead. You should be able to click on the Shared GAL connector to see the progress. Now that we have objects running through the synchronization rules, we should be able to check a few places to make sure that objects are flowing. First, check the the Shared GAL containers in the resource forest for contact objects. Next, after a round of sync cycles, you should be able to check your tenants for objects from the partner organizations forest as contact objects. That’s all she wrote! Be fruitful and multiply contacts!